I met April when we both worked in the Telegraph-Journal in Saint John. While we worked on a few minor projects together, we were usually in different sections of the paper. However, we did have a great interest in running and we talked a lot about it during breaks from the grind – whether it was the latest event we entered or strategies for the upcoming race. It was great to have an ally to discuss the sport and help alleviate some of the stresses journalism brings. April is extremely passionate about running and in 2013, her results reflected the dedication of her training. About a year ago, with one half-marathon and a few other races under my belt, I was in goal-setting mode as the new year approached. I had taken a few weeks to recover and wanted a new challenge. Instead of upping my distance, I decided I wanted to take another crack at the half-marathon. Sometime in February I signed-up for the Fredericton race and took my time preparing for the race, which took place May 12. The setting for that event was rainy and cool, but the course was very flat. There was one minor hiccup – I forgot my Garmin, which I had come to depend upon for pacing. But it turned out to be a good thing, because I blew away my PR of 2:16, coming in at 2:01:40. It was faster than I ever imagined. 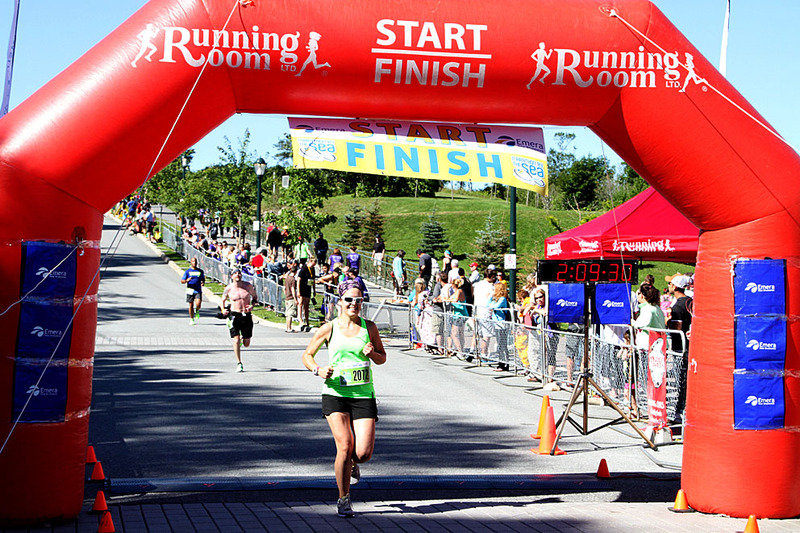 At that point, the Tri-Cities Run Challenge had been initiated by the running community in New Brunswick. 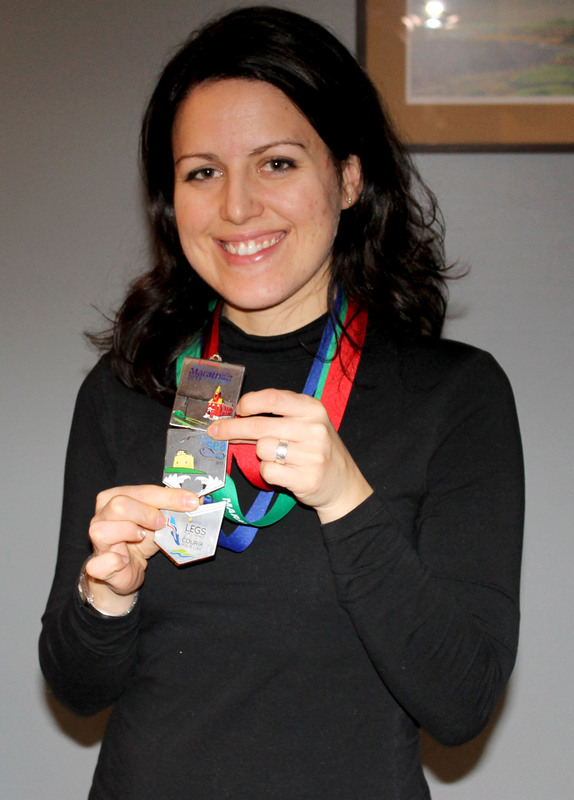 I knew I would probably participate in all three major races – in Fredericton, Moncton and Saint John – but wasn’t sure I would be up for running three half marathons. Well, after the Fredericton race, I felt a lot more committed. I knew it would mean near-constant training straight through until October, but I enjoy running so much, I knew it would be worth it. By the time August rolled around, I was ready to take on the hills of Saint John. The Marathon by the Sea is always a tough one, not just because of the hills but the weather can be warm and humid. This year, the weather was fine at 20 C. I knew I wouldn’t beat my new PR, but I was eager to blow away my course record from 2012. I crossed the finish line with a smile on my face at 2:09:09. The final race would be at Legs for Literacy in Moncton on Oct. 27. My training had been steady up until this point, and things were looking good. I felt strong and ready, but due to a slight health issue, I wasn’t pressuring myself to beat 2:01. Race day arrived and it was cold and very rainy. But with another flat course, everything lined up. My pace was faster than expected. I remember feeling glee at the 15 km mark, knowing that I had a chance at beating 2 hours. Eventually the two-hour pace bunny caught up to me and I pushed with everything I had to keep ahead of him. I came in by the skin of my teeth at 1:59:54, and burst into tears at the finish. Looking back, it’s kind of hard to believe I accomplished my goal of running three half-marathons in one year. Running 21.1 km in under two hours wasn’t even really a goal until I had it within reach. Ever since I started running races a couple years ago my goals have always been just to keep improving – and it works! For me, the enjoyment and fulfillment that running brings continues to surpass anything I ever imagined. I feel good. I feel confident. I am happy. It’s simple and joyful. It’s a challenge, but it’s fun. Along the way there were a few challenges: between work commitments, holidays, heat, cold and rain – but nothing was insurmountable. I’ve made running a priority in my life, and I have fortunate not to deal with any injuries. In a way accomplishing my running goals has filled me with pride, but in another way, it just seems like something I needed and wanted to do. Running is now a part of who I am, and I can’t imagine not doing it. Here is April displaying her Tri-Cities medal.